The Old Testament contains many well-known and loved stories – Adam and Eve, Noah’s Ark, Moses, Joshua and Jericho, David and Goliath, etc – but these stories raise many questions. Is the creation story compatible with modern understandings of the big bang and evolution? Did God really flood the whole world? Did a whale really swallow Jonah and dump him on a convenient beach? Does archaeology support the truth of the Bible? Read a little more and you’ll find deeper issues. Are the Old Testament stories at all historical? Were Abraham, Isaac, Jacob and Joseph real historical people? Did Moses really lead 2 million people out of Egypt, across the desert and into Canaan? Would a good God really encourage the wholesale slaughter that accompanied the Israelites’ settlement in the Promised Land? Did God really speak through prophets like Elijah, Isaiah and Ezekiel? Were Old Testament prophecies actually fulfilled? Did God really write or inspire the Old Testament? This page examines all these questions, and more, based on the conclusions of historians, archaeologists, scientists and theologians. You might be surprised at some of the answers. Let’s start by summarising what the Old Testament is. The Old Testament is the Christian form of the Jewish scriptures, known as the Mikra (= “that which is read”) or the Tanakh, which is an acronym made from the three major divisions: Torah (= “teachings”, the first five books), Nevi’im (= “Prophets”) and Ketuvim (= “Writings”). The Christian Old Testament is a collection of 39 separate “books” by many different authors. It is likely that many of the earlier books began as stories that were passed down orally, shaped and added to in the process, and only written down later, mostly somewhere between 1000 BCE and 500 BCE. Authorship of most books is traditionally attributed to major figures in Jewish history, but while they would likely be associated with the events or teachings recorded, it seems that the final form of these books was probably determined by later scribes who wrote down the oral history and edited it. The books of the prophets were probably compiled by followers of each prophet, during their lifetime or shortly after. prophecy – not so much predicting the future as showing graphically God’s interest in justice and mercy towards the suffering and downtrodden and his displeasure at injustice and false religion, whether in Israel or the surrounding nations. apocalypse – an imaginative form (something like prophecy) of outlining God’s big picture. The Old Testament begins with the creation story (Adam & Eve) and several other stories that sound like myths – Cain killing Abel, the tower of Babel and Noah and the great flood. The main story of the Old Testament begins with Abraham, a wealthy herdsman living in ancient Sumer, who moves his family to Canaan (more or less today’s Israel & Palestine, with a small portion of today’s Lebanon and Jordan) in obedience to the call of God. After a few generations (Isaac & Jacob), famine forces the family to seek food in Egypt, which isn’t so affected by drought because of the regular flow of the Nile, and where one member of the family, Joseph, has become an important leader. However over a few more generations, their descendants are forced into slavery. One of the Hebrews, Moses, is fortunate to become a prince and via a series of miracles, leads the Israelites, now numbering maybe 2 million people, out of Egypt, across the Sinai desert, and into Canaan. Under the military commander Joshua, the Israelites conquer the inhabitants and settle in their “Promised Land” given them by God. However things don’t go well for them. Sporadic fights with the Philistines and other surrounding tribes, a few decades of glorious victory and prosperity under the kings David and Solomon, when the great temple of God is constructed in the holy city of Jerusalem, are followed by a split in the kingdom and compromise of their true religion with detestable pagan practices. The northern kingdom is conquered by the Assyrians (the strongest power in the area for a century or so) and then the southern kingdom, which is centred on Jerusalem and the temple, and is supposed to be the remnant faithful to God, is conquered by the new superpower, the Babylonians, and the upper classes taken off into captivity to work as slaves again. Over much of this time, prophets like Isaiah, Jeremiah, Ezekiel and the rest warn the nation, and then explain that these calamities are God’s judgment on their “unfaithfulness”. Eventually the exiles return, rebuild Jerusalem and the temple, and the Old Testament ends (several centuries BCE) with hope that God will one day send his “Messiah” (an anointed leader) and restore the nation to its (they believed) rightful place as a powerful nation, sharing the goodness of God with the world around them. Scholars have different views of the Old Testament, mostly determined by whether they think the Old Testament documents are sufficient evidence to establish historicity (“maximalists”), or whether they require “hard” archaeological evidence (“minimalists”). There are of course many scholars, perhaps the majority, whose view is somewhere between the two. For much of their early history the Hebrew people were nomadic or living in small settlements, and their lifestyle didn’t lend itself to building monuments, making inscriptions, minting coins, or even building stone houses, all the things which modern archaeology can most easily find and identify. So there is little archaeological evidence to support, or refute, the early sections of the Old Testament (say before king David, who lived around 1000 BCE). So the minimalists generally regard the early parts of the Bible (Abraham, Moses, Joshua, etc) as almost totally unhistorical while the maximalists accept at least a fair portion of it as historical. Both sides conclude that the later period (1st millennium BCE) is basically historical, though there is still disagreement about many aspects. In the discussion which follows, I have tried to consider both viewpoints, and take a middle view, which I think is the most common view among scholars. I think both the maximalists (who tend to be christians defending the Bible or Jews defending the modern nation of Israel’s right to live in the land) and the minimalists (who tend to be sceptical non-believers) can both be very selective in the evidence they use. Most scholars regard the first 11 chapters of Genesis (creation through to Noah) as being legendary or mythical. 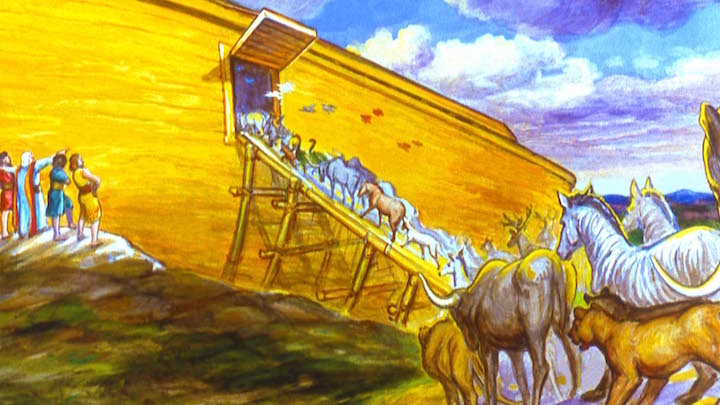 The creation and flood stories have strong similarities to Akkadian (Mesopotanian) myths, which appear to have been re-told to emphasise the role of the Hebrew God Yahweh instead of the polytheistic gods of Mesopotamia. The stories of the Patriarchs (Abraham, Isaac and Jacob) generally reflect culture and life at the time, as revealed in clay tablets and other inscriptions, and so may be quite true, or not – we have no way of verifying the Biblical account. But whatever the historical truth about them, the main purpose of these stories isn’t history, but establishing God’s relationship with the people of Israel. The most problematic parts of the Old Testament are the stories of slavery in Egypt, the exodus and the invasion of Canaan. In itself, the presence of Hebrews in Egypt is not unusual – it apparently wasn’t uncommon for bad seasons to push some of those in Canaan to seek food in Egypt. But scholars doubt the numbers portrayed in the Bible, especially the 2 million leaving under Moses, which would have been logistically impossible. Moses may be an Egyptian name, but little else about the story can be verified – no remains of the migrating Hebrews have been found (surprising if there were 2 million of them, but unsurprising if there were much less), and it is difficult to find a time in documented Egyptian history to fit in the exodus events. Most historians think there was some historical basis for the story, but doubt that much of what we read actually happened like that, and think that the Israelites were only a small group. There is archaeological evidence for fighting in Canaan around the time of Joshua (though the dates are much disputed), but overall the evidence (at Jericho and elsewhere) points to a much smaller “invasion”, and a lot of coexistence with sporadic fighting. Historians believe that many of the ancestors of the Israelite nation were living in Canaan all the time, and only a smaller group travelled across from Egypt. It seems the best way to understand these events is as “fictionalised history”. Most of the stories probably began with real events and real people, but the stories grew in the telling as the Israelites sought to justify their claim to their territory, and their belief that God was with them. The remains of Hezekiah’s water supply tunnel into Jerusalem have been found and the tunnel can be walked through. Inscriptions on walls, tablets and stone monuments verify Biblical stories of attacks on Israel and Judah by the Pharaoh Shishak, the Assyrian kings Shalmaneser and Sennacherib, and by Mesha, king of Moab. A clay cylinder records the conquest of Babylon by Cyrus of Persia, and his decision to allow the Judean captives to return to their homeland. The remains of the city wall built by Nehemiah have also been found. The names of dozens of people and cities mentioned in the Old Testament have been verified by archaeology. Of course many other events cannot be verified, and some are still disputed (e.g. how important and large the kingdom of David and Solomon was), but we can say that this period in the Old Testament can be considered as generally historical, despite the disputes. So with that background, we are now ready to attempt answers to the questions we began with. Is the creation story compatible with modern understandings of the big bang and evolution? If we take Genesis literally, then science and Genesis are incompatible. But if we take the early chapters of Genesis as myth (as many christians now do), then there is no real problem. Did God really flood the whole world? There is no evidence of this. The existence of other, and often earlier, flood stories in Akkadian folklore suggests there was a large flood back about 3000 BCE, but it would only have been local. Did a whale really swallow Jonah and dump him on a convenient beach? We can regard this as a legendary story about a true prophet. For ancient Jews, the story apparently contained humour. Does archaeology support the truth of the Bible? This claim is often made by christians (see here for example), but it is only half true. As we have seen, there is good archaeological evidence for events recorded in the later Old Testament from about 1000 BCE onwards (and reasonable support for the New Testament too). And it is noticeable that christian apologetics sites mostly reference discoveries relating to the first millennium BCE. However these apologetics sites don’t tell us that the evidence for earlier Bible history is very sparse, which we’d expect even if it was true, and in some cases (notably the “conquest” of Canaan) the evidence tends not to support the Biblical account in many details. Were Abraham, Isaac, Jacob and Joseph real historical people? We cannot know for sure, but it seems likely that they were real people about whom legendary stories built up over time. Did Moses really lead 2 million people out of Egypt, across the desert and into Canaan? Almost certainly not. There was probably a real Moses (though not necessarily with that exact name) who led a smaller group of Hebrews out of Egypt. We cannot know how historical the stories are. We cannot know if he really received Ten Commandments from God on stone tablets, or whether (as seems likely) the laws were taken from law codes in surrounding nations. Would a good God really encourage the wholesale slaughter that accompanied the Israelites’ settlement in the Promised Land? It is hard to believe a good God, as revealed by Jesus, would do this, and the historical evidence is that the massacres didn’t occur to the extent portrayed in the Old Testament. It seems that the statements are written by people who had only a partial revelation of God, and wrote these stories to strengthen their image as a people and their claim to their land. Did God really speak through prophets like Elijah, Isaiah and Ezekiel? There is no historical reason to think that he didn’t – this is a matter of belief or disbelief. Were Old Testament prophecies actually fulfilled? When checked, it seems that most prophecies were fulfilled to some extent, some to a great extent, but often not in every detail. This would have been known at the time of compiling the prophet’s writings, but didn’t seem to concern them. It seems that the Jews saw the prophets as expressing God’s will in a general sense, with some of the details considered as poetic language rather than precise prophecies. If we take prophecy this way, we can say that the prophets were generally reliable. Are the Old Testament stories at all historical? Thus we can be fairly certain they are neither fully historical nor fully unhistorical. They appear to be similar to the foundational stories of other cultures, containing historical records, myths and other writings in a form that explains the origins of the people and their customs and culture, and outlines the values and lore that the culture finds important. Other examples abound. The Australian aboriginal peoples have passed down their “Dreaming” stories for tens of thousands of years. They may include creation and ancestor stories in a mythic form, lore and customs that govern the life of that tribe or nation and practical guidance on where and when to find various foods. We might think that they are just legends, but they kept aboriginal nations’ culture alive for millennia, and have been found to contain reminiscences of geography before the sea level rose after the last ice age, about 10,000 years ago. Whether they are historically true or not, they are true for the aboriginal peoples and preserve important and life-giving truths. Homer’s stories of the war against Troy were once dismissed as legends, but more recent archaeology has shown that an ancient city of Troy existed, and a war with Mycenaean Greece took place. The stories appear to preserve both history and legend. Irish mythology tells stories of gods and mythical heroes, but some of the stories (contained in the Historical Cycles) contain verifiable history and myth mixed. The mythology explains how the Irish view themselves and how they got to be where they were. While we can see similarities with the culture and legends of surrounding peoples, the Old Testament stories also show significant development, from polytheism to monotheism, from a capricious tribal god to the loving Creator of the universe, and from a culture that supported the privilege of the ruling class to an ethic that stresses justice to the poor and powerless. These are significant differences, and can be considered to be due to the gradual revelation of God. Did God really write or inspire the Old Testament? This is clearly a question for each individual to answer for themselves. If we expect that God could only have written a perfectly accurate, fully historical book, then we can probably conclude that it doesn’t look like that. But I see no reason why God couldn’t use legend to reveal truth, just as non-historical parables, poems and visions may do. It seems to me that God began with the Hebrew people as a small group with typical beliefs, practices and legends of their time and place, and gradually refined their culture and beliefs as we move through the Old Testament. The prophets were a significant step forward from the early parts of the Old Testament, but God’s full revelation only came with Jesus. So, can we believe the Old Testament? I conclude that we can believe the Old Testament for what it is, but not necessarily for all that some people claim it to be. We can (and I believe should) accept the assessment of its history by scholars who avoid either of the more extreme views. Its teachings were appropriate for its time, but we now know much more of God’s character, so the teachings of Jesus supersede the Old Testament. I don’t think the non-historical nature of some of the Old Testament is any reason to disbelieve in God or Jesus. In fact, researching all this has, if anything, strengthened my belief, because it reinforces that CS Lewis’ view makes sense, and it doesn’t require me to believe things that are difficult to believe. I have looked at all this in greater detail in What the scholars tell us about the Old Testament, which also contains many references.